DO I NEED TO CREATE A BeeMetics ? No, you do not need to create an account to purchase on our website. How do I create a BeeMetics account? You can create an account by clicking ‘My Account’ in the main menu. You will be asked to submit your email address, and create a password of your choice. If you choose to subscribe to our newsletter, we’ll keep you up to date with all the latest BeeMetics news, exclusive offers and product launches direct to your inbox. We’ll only send you email newsletters if you ask us to. We’ll never pass your details onto anyone else and you can unsubscribe whenever you like. If you’re having trouble signing in, please check you’re using the same email address and password you used to register with us.Our passwords are case sensitive, so check you haven’t accidently left Caps Lock on. If you forget your password, you can reset it, by clicking on the forgotten password link on the login page. An e-mail containing a link to create a new password will be sent to the email address with which you registered. Please check your junk mail folder in case it makes its way there. If you haven’t shopped with us for a while, you may need to create a new account. You can use the same email address and password as before. When browsing on the BeeMetics website, by adding the product to your basket, you will be asked whether you want to continue shopping, or proceed to the checkout. You can add more than one product to your basket at any time. When you are ready to checkout, follow the checkout process. When you check out, you will be offered the choice to pay with your debit/credit card or to checkout using PayPal. If you use PayPal, you will need to tick the box to accept our Terms and Conditions and then you will be taken to the PayPal site to complete your order. All BeeMetics products include UK Value Added Tax (VAT), where applicable. Total tax payable will be itemised at checkout. All BeeMetics international orders are shipped from the UK, so you may be charged import duties or taxes when the parcel reaches the delivery country. These charges vary and must be paid by the recipient of the parcel. If you have any questions related to customs charges, please contact your local customs office. BeeMetics allows payments to be made in British Pounds Sterling (GBP) at this time. CAN I ADD ITEMS, CHANGE OR CANCEL MY ORDER ONCE I’VE CONFIRMED IT? Unfortunately, once your order is complete, you can no longer add items, or change your order. If you want to add items, you should place another order within 24 hours of your original order, then contact us with both order numbers, and we’ll be happy to refund you the additional delivery charge. You should be able to cancel your order within 24 hours of placing your order, but sometimes our warehouse is really quick at getting the orders out the door and they could have already dispatched it to you, if this is the case we would be unable to cancel it. However, you can return the parcel to us as long as it is as not been opened.Non-EU and Non-US orders are final and cannot be cancelled, returned or refunded.This does not affect your statutory rights. Due to security reasons we are unable to place orders over the phone or email. WHY CAN’T I VIEW SOME OF THE WEBSITE IMAGES? This could be an issue that we’re unaware of with our website, so please Contact us to let our customer services team know about it. To help us solve the issue for you, please let us know the URL you were trying to view. I’M HAVING TROUBLE WITH MY SHOPPING Cart? We can’t always work out why some people have some problems with websites and others don’t, it has a lot to do with how up to date your operating system and browser is, or what browser you’re using. Sometimes it helps just to close the browser and reload it. You might also want to try clearing your browsing history including your cookies as this often solves a lot of issues. Don’t worry if you’re not technically minded and are unsure about the above; Contact Us and give us as much information as you can and our Customer Services Team will try their best to help you. If you’re having trouble signing in, please check you’re using the same email address and password you used to register with us. Our passwords are case sensitive, so check you haven’t accidently left Caps Lock on. If you forget your password, you can reset it, by clicking on the forgotten password link on the login page. An e-mail containing a link to create a new password will be sent to the email address with which you registered. Please check your junk mail folder in case it makes its way there. WHY HAS MY CARD PAYMENT FAILED? We’re not able to specify why card payments fail as the payment process involves both our systems and your bank. In the first instance you should double check you’ve entered all the details correctly, that you are using a card which has not expired, and that your billing address has been entered at checkout exactly as it appears on your bank statement. If your billing address is incorrect it will cause your payment to fail – this is a security measure banks put in place to protect your security. If all else fails then please try an alternative card for payment – we accept all major credit and debit cards, as well as PayPal. We’re not able to specify why card payments are declined as the payment process involves both our systems and your bank. In the first instance you should double check you’ve entered all the details correctly, that you are using a card which has not expired, and that your billing address has been entered at checkout exactly as it appears on your bank statement. We protect any personal information you provide on a secure server. We also operate a secure SSL 128-Bit Encrypted payment system, so you can be sure your orders are being processed safely. When in the checkout, you’ll see our Comodo secure certificate, confirming your data is safe. Depending on which browser you are using, this can be accessed by clicking on the padlock symbol in the address bar (Microsoft Internet Explorer, Google Chrome, Apple Safari. I AM HAVING PROBLEMS ACCESSING OR BUYING FROM YOUR WEBSITE? If you are using a computer at your place of work, you may also wish to check that they haven’t blocked access to the BeeMetics website as part of their policy for personal computer use during working hours. When placing an order with BeeMetics, select the items you wish to purchase and enter your promotion code within the promotional code box found in your shopping bag at the bottom of the page. Click the ‘apply’ button and the relevant discount will be applied to your order. CAN I ENTER MORE THAN ONE PROMOTIONAL CODE? Not at this time. You can only use one promotional code at a time. If you enter more than one promotion code, only the last code you enter will be applied to your order. WHY DOESN’T MY PROMOTION CODE WORK? Your promotion code may have expired. Please check the validity dates and times of the promotion code you are trying to enter. You may have entered the incorrect promotion code. Please check that you have entered the correct code for the country to which you are having your order delivered. You may not have spent the minimum required to activate the promotion. Please check the promotion terms and conditions to see if your order qualifies. Sometimes there may be a different minimum spend for different countries. Always check that your discount has been applied to your order before you complete your order as we cannot apply the discount to your order after the order is complete. The discount will be applied when you enter the promotion code in the shopping cart, but will only show on your order once you proceed to the checkout. In the case of promotion codes for free or discounted delivery, the discount will only show on your order once you have chosen your delivery option. HOW MANY TIMES CAN I USE THE SAME PROMOTION CODE? This will differ depending on the specific promotions. While some promotion codes may be single-use only, others may be used as often as you like. The restrictions will be clearly displayed in the terms & conditions of each promotion code. CAN THE PROMOTION CODE BE USED WITH OTHER OFFERS? At this time, you can only use one promotion code per order. Our site will update your order with only the last promotion code you entered. If you enter more than one promotion code, only the last code you enter will be applied to your order. In some cases, certain product ranges may be excluded from a particular promotion. The restrictions will be clearly displayed in the Terms & Conditions of each promotion code. I FORGOT TO ADD MY PROMOTIONAL CODE BEFORE I CONFIRMED MY ORDER…CAN THE DISCOUNT STILL BE APPLIED? Unfortunately, it is not possible to apply the discount after you have placed your order. Please check that the discount has been applied before you click “Confirm order”. WHERE CAN I FIND YOUR PROMO CODES? From time to time we will release promo codes for different discounts and special offers on our website. These will be sent via our newsletter or posted via our pages on social networks (e.g. Facebook, Twitter, Instagram etc). Yes, we deliver worldwide with the exception of Brazil and Russia, due to current shipping legislations. We always try to ensure that your goods are delivered on time. However, sometimes it is delayed by factors beyond our control i.e. adverse weather conditions, strikes and customs. If you are not at home when delivery is attempted a card will be left with the carriers contact details for you to rearrange delivery. If you fail to contact the carrier, they will attempt to deliver again, on the third attempt your parcel will be returned to us. All BeeMetics international orders are shipped from the UK, so you may be charged import duties or taxes when the parcel reaches the delivery country. These charges vary and must be paid by the recipient of the parcel. If you have any questions related to customs charges, please contact your local customs office. Damaged items will need to be returned to us, before we can issue a refund or a replacement. Please refer to our Return & Refund policy for more information. Unfortunately, once your order is complete, you can no longer add items, or change your order. If you want to add items, you should place another order within 24 hours of your original order, then contact us with both order numbers, and we’ll be happy to refund you the additional delivery charge. You should be able to cancel your order within 24 hours of placing your order, but sometimes our warehouse is really quick at getting the orders out the door and they could have already dispatched it to you, if this is the case we would be unable to cancel it. However, you can return the parcel to us as long as it is as not been opened. This does not affect your statutory rights. Non-EU and Non-US orders are final and cannot be cancelled, returned or refunded. Unfortunately, once your order has dispatched, you cannot cancel your order. However, you can easily return your order to us as long as it has not been opened. Porch Honey will process any refund upon receiving any returned goods and assign them for their fault. Once your refund has been processed, it will take 5-7 (Card issuers have advised it can take upto 21 days to enter your account) working days to appear in your account. ARE YOUR PRODUCTS TESTED ON ANIMALS OR NOT SUITABLE FOR VEGANS? Our products are not tested on animals, and the insects that create the honey, propolis, bee venom or bees wax are not harmed. All our products are not suitable for vegans in general because of their personal views. BeeMetics respects others opinions in these matters, that is why we try to be better at what we do. WHATS THE DIFFERENCE BETWEEN A SERUM AND A MOISTURISER? A facial serum works by feeding nutrients into deeper layers of your skin that a normal moisturiser is not able to reach. A moisturiser has larger molecules than a serum which means it will not typically penetrate into the skin as deeply as a serum. We recommend you apply the serum before your moisturiser for a double dose of hydration and benefits. From time to time we may run customer competitions to win our products. These may be hosted on our own website, via our own social media channels or hosted on other websites we have a partnership with. Any email data that is collected will not be shared with third parties unless you specify that you would like to opt-in to receive third party communications. This will always be clearly stated and there will be an opt-in box provided. All our competitions have attached terms and conditions on how to enter and the competition start and end dates. These will either be provided on the website page on which it sits or in the comments section if it is a social competition. Winners of our competitions will be contacted the next working day (If the competition closes on a Saturday, Sunday or Bank Holiday, then they will be contacted the next following working day). Winners will have 2 weeks in which to provide a response with their details to allow for fulfilment of the prize. 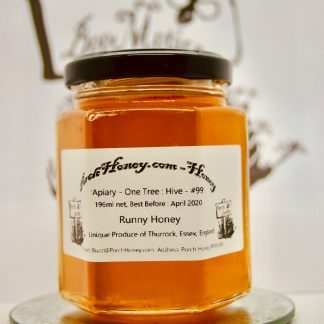 If no response is received, Porch Honey reserve the right to randomly select another winner. Please note that competition prizes cannot be refunded or exchanged for cash alternative. From time to time we may run promotional activity which may be code based or marked down pricing on a product. Please be aware that percentage discount promotional activity excludes all Kits, Outlet items and already discounted items. – No it doesn’t only shipping attracts VAT as it is considered a service. 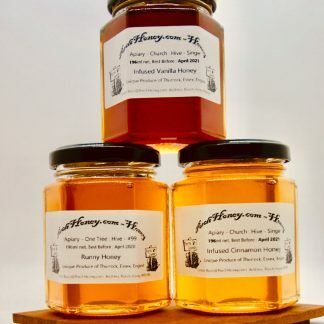 – No we never blend honey we take every opportunity to keep our honey separate to allow our customers to taste unique flavours that are overpowered by pollination crops. – No we have realised that intensive pollination is very likely to harm wild pollinators.